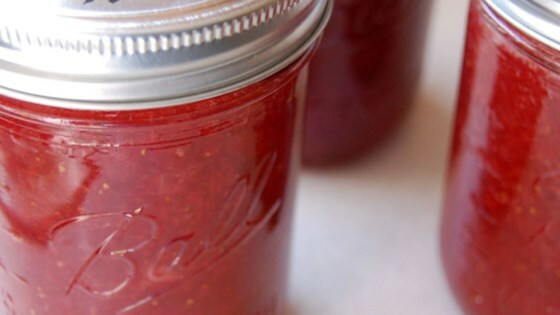 "This is by far the easiest recipe I have found for strawberry jam without using a pectin. The jam is soft, spreadable and delicious." In a wide bowl, crush strawberries in batches until you have 4 cups of mashed berry. In a heavy bottomed saucepan, mix together the strawberries, sugar, and lemon juice. Stir over low heat until the sugar is dissolved. Increase heat to high, and bring the mixture to a full rolling boil. Boil, stirring often, until the mixture reaches 220 degrees F (105 degrees C). Transfer to hot sterile jars, leaving 1/4 to 1/2 inch headspace, and seal. Process in a water bath. If the jam is going to be eaten right away, don't bother with processing, and just refrigerate. Turned out great! Water bath is about 10-15 minutes in boiling water for those that don't know.